St John Center Lutheran Church, East Earl, PA .
Primary comparative texts about Food & Fellowship (including "the blessing of meals"), and Prayer and Piety (includes texts about healing), from Philo, Josephus, Lucian, Pseudepigrapha, Babylonian Talmud, Midrash, Philostratus. At Mahlon H. Smith's (Rutgers University) Into His Own: Perspective on the World of Jesus. "Bread and Fish," The Jesus Database, an online annotated inventory of the traditions concerning the life and teachings of Jesus. Dr. Gregory C. Jenks, FaithFutures Foundation. Commentary, Matthew 14:13-21, Warren Carter, Preaching This Week, WorkingPreacher.org, 2014. "Jesus enacts God's will that hungry people be fed. He anticipates the abundant blessing of good food described by Ezekiel and Isaiah in the time when God's empire is established in full..."
"The Real Miracles of the Story," David Lose, ...in the meantime, 2014. "God still cares deeply and passionately for those who are most vulnerable – the poor, the immigrant, the hungry – and God continues to use us to care for them." "When a Miracle Is More Than a Miracle," Karoline Lewis, Dear Working Preacher, 2014. "Taking away the reality of miracles does no one any good. We need them." " Gut-Wrenching Gathering," D. Mark Davis, Left Behind and Loving It, 2014. "The story that precedes this text is the senseless death of John the Baptizer. John's disciples (or, perhaps Jesus' disciples, it's kind of hard to tell to whom the pronoun "his" refers) buried John's body and then came and told Jesus (v.12)." "What about the left-overs?" Liz Crumlish, journaling, 2014. "ENOUGH!!" Stan Duncan, If You Lived Here You'd Be Home By Now, 2014. "Which is actually the greater miracle: for Jesus to change those few loaves into an abundance of loaves, or for Jesus to change the hearts of the people there to teach them how to share?" "And Plenty for the Pilgrimage Home," Andrew King, A Poetic Kind of Place, 2014. "Participating in a Miracle," Faith Element, 2014. "Jesus the Host," Christopher Burkett, Preacher Rhetorica, 2014. "There comes a stage in a relationship when you say, 'Let's eat together, come round for a meal.'" "Could Loaves and Fishes Change the Immigration Dilemma?" Verity Jones, ON Scripture, Odyssey Networks, 2014. Video: "On the Street: The Immigration Crisis." "Has your own community talked about receiving the undocumented children stuck at the border into your city?" "Welfare Jesus," Roy Terry, Question the Text, 2014. "While the wealthy and powerful had all the luxuries of Roman life, the poor, hard working, and common folks struggled for health care, a meal, or even basic human rights. Jesus gives it all away. With no strings attached." "More Than Enough," Nancy Rockwell, The Bite in the Apple, 2014. "The regular practice of Sacrament, as an outward and visible sign of inward and spiritual grace, lacks the pang, punch, and palpable presence of God in our own lives, but only because we do not tell our own stories and our spiritual hungers as part of the ritual." "On Loaves and Fishes and Parking Spaces," Janet H. Hunt, Dancing with the Word, 2014. "How do you understand the miracle story of the feeding of the 'five thousand plus women and children?' What do you think happened here?" "A Feast of Plenty in the Face of Death," Andrew Prior, First Impressions, 2014. "Herod's kingdom is ultimately a kingdom of scarcity..."
"Channels of Compassion," Alan Brehm, The Waking Dreamer, 2014. "When we give compassion freely, it ripples out far beyond our ability to explain or even imagine. Those streams of kindness and mercy that flow through us have an effect that only God knows." In Babette’s Feast a refugee chef from the bloody civil war in Paris, Babette Hersant, has found refuge with two elderly sisters, becoming a Christ figure whose food nourishes souls as well as the body. Ed McNulty, Visual Parables. Evangelio Comentario del San Mateo 14:13-21 por Mercedes García Bachmann, Working Preacher, 2014. Commentary, Matthew 14:13-21, (Pentecost 7), Mark G. Vitalis Hoffman, Preaching This Week, WorkingPreacher.org, 2011. "Dostoevsky, in the magnificent "The Grand Inquisitor" chapter of The Brothers Karamazov, ties the matter of bread and hunger to the temptation of Jesus in Matthew 4:1-11." Feeding of 5000, audio telling, story in episodes, graphic, audio and written commentaries. Go Tell Communications, Biblical Storytelling for the Global Village, 2011. Holy Textures, Understanding the Bible in its own time and in ours, Matthew 14:13-21, David Ewart, 2011. "This lesson invites us to remember our own wildernesses, our own places of chaos, when our own insufficiencies may have been blessed, broken, and given away. And yet it was precisely in risking that impossible insufficiency that there was enough. Indeed, more than enough." "You Want Us to Do What?" Alyce McKenzie, Edgy Exegesis, Patheos, 2011. "...over and over again in life, we stand in the shoes of the disciples in this passage: surrounded by human need, faced with a challenge, knowing we do not have the resources, in our own wisdom, wealth, and strength, to meet the need, to stand up to the challenge." Comentario del Evagelio, San Mateo 14:13-21, Guillermo Hansen, Working Preacher, 2011. "Nos encontramos con uno de los relatos más conocidos del evangelio, la acogida de Jesús de quienes lo seguían y la alimentación de la muchedumbre." "Too Tired to Care?" Peter Woods, I am Listening, 2011. "The primary miracle, as I read it from the demands and exhaustion of pastoral ministry, is that a human being endangered by a head hunting king, in grief over John’s death, exhausted by an itinerant ministry; can find the compassion in the midst of all this to care about healing and feeding those needy crowds." Lectionary Blogging, July 31, 2011, John Petty, Progressive Involvement, 2011. "This 'good eucharist' follows what what you might call a 'negative eucharist'--Herod's 'black mass.'" Deserted Places, Karen Gibson, The Hardest Question, 2011. "What does a deserted place look like?" "A lonely place," Neil Chappell, a weird thing, 2011. "Life is not about the disappointments we face. Life is not the sum of all our defeats. Life is how we respond." Commentary, Matthew 14:13-21, Marilyn Salmon, Preaching This Week, WorkingPreacher.org, 2008. "First Thoughts on Year A Gospel Passages in the Lectionary," Pentecost 8, William Loader, Murdoch University, Uniting Church in Australia. "The last supper makes sense in the light of all the other meals including this one and they make sense in the light of the vision of liberation and reconciliation which inspired them. To receive him in bread and wine is also to participate in the vision and nourishment which makes it possible." Dylan's Lectionary Blog, Proper 13. Biblical Scholar Sarah Dylan Breuer looks at readings for the coming Sunday in the lectionary of the Episcopal Church. "The first miracle was the one we usually talk about -- the multiplication of the loaves. The second one was the kind of miraculous trust Jesus inspired in those who came to him, the trust that made everyone there willing to forget about years of "you are what you eat" conditioning to accept bread from Jesus without knowing or asking about where it came from and whether it was safe or kosher." "Five Loaves and Two Fish to Feed 5,000," Gospel Analysis, Sermons from Seattle, Pastor Edward F. Markquart, Grace Lutheran Church, Seattle, Washington. Detailed background and exegesis. "In the miracle of the five loaves, two fish and feeding of the five thousand, what part of the story is most meaningful to you and why?" "I wonder what might happen if at all our congregational potluck meals we invited the homeless and poor to come and eat -- knowing that they couldn't bring a dish to share." "It is good to know that fear (Herod) and grief (John) are not able to capture and control compassion (sick) and generosity (hunger)." "Jesus Feeds the Five Thousand," Rev. Bryan Findlayson, Lectionary Bible Studies and Sermons, Pumpkin Cottage Ministry Resources. Includes detailed textual notes. "God Blesses Our Scarcity with Abundance," Larry Broding's Word-Sunday.Com: A Catholic Resource for This Sunday's Gospel. Adult Study, Children's Story, Family Activity, Support Materials. "What was the last truly memorable meal you ate? Why does the memory stand out?" Wellspring of the Gospel, Ordinary 18A, Catherine McElhinney and Kathryn Turner, Weekly Wellsprings. Matthew 14:13-21, at Austin Presbyterian Theological Seminary's An Exegetical Study of the Common Lectionary, coordinated by Prof. John E. Alsup, features rough translation, disposition, immediate context, broader context, hermeneutical bridge, and contemporary address. "Is this a story about food "quantity" (feeding of 5,000 people) or food "quality" (you! give them to eat)? Or perhaps both?" "Meals, Food and Tablefellowship." Jerome H. Neyrey, in The Social Sciences and New Testament Interpretation, 159-82. R. L. Rohrbaugh, ed. Peabody, Mass. : Hendrickson, 1996. "How can readers understand the particular ceremony of meals and table fellowship? Why are meals so important as symbols of broader social relationships? How can we peer below the surface and grasp the social dynamics encoded in meals and commensality, what anthropologists call "the language of meals"?" Allen, Charles W., "A Sermon: When Worlds Break Open," Encounter, 2004. Burghardt, Walter J., S.J., and Katharyn L. Waldron, "Jesus Feeding the Hungry: Miracle or Mandate?" The Living Pulpit, 2007. Fink, Peter E., "The Challenge of God's Koinonia," Worship, 1985. Hunter, Amy B., "Big Story," The Christian Century, 2005. Schurb, Ken, "11th Sunday after Pentecost: Matthew 14:13-21," Concordia Theological Quarterly, 1983. Summers, Charles A., "Between Text and Sermon: Matthew 14:13-21," Interpretation, 2005. You Provide The Bread, William J. Carl, III, SermonStudio. "Exodus from Hunger: Faith & Global Hunger," the Rev. David Beckmann, Day 1, 2010. "Our Mentality of Scarcity among God's Abundance," 30 Good Minutes, Chicago Sunday Evening Club, 2008. "Extravagance," Bishop William H. Willimon, Day 1, 2005. "Pushed Beyond the Limits," 11 Pentecost - 31 July 2005, Walter Harms, Göttinger Predigten im Internet: Every Sunday Sermons based on the RCL by a team of Lutheran theologians/ pastors. "Multiplication of Loaves and Fishes," Fr. Jerry Fuller, o.m.i., 1999, at Sermon & Lectionary Resources, Richard J. Fairchild. "Five Loaves and Two Fish to Feed 5,000," "World Hunger Sunday," Pastor Edward F. Markquart, Sermons from Seattle. "I love a Mystery," Bishop Woodie White, Day 1, 2002. "Storypath Lectionary Links: Connecting Children's Literature with our Faith Story," August 3, 2014, Union Presbyterian Seminary. Genesis 32:22-31 and Eric the Boy Who Lost His Gravity by Jenni Desmond, Romans 9:1-5 and Separate Is Never Equal by Duncan Tonatluh, Matthew 14:13-21 and Picnic by John Birningham. 2011. Faith Formation Journeys, Children's Sermon, Pentecost 7A, 2011. The Great Picnic, Wesley T. Runk, SermonStudio. "Jesus Feeds Many People," Illustrating the Story (lessons, children's sermons), coloring pages, activity sheets, crafts, children's songs. MSSS Crafts. "Super Size It," Charles Kirkpatrick, Sermons4kids.com. "Feeding the 5000," Jim Kerlin, childrensermons.com. "Jesus Gives Lunch to Thousands of People," Sunday School Lessons: Family Bible Study, art projects, music, stories, etc. "Bertie from Bethsaida," Pete Smithies & Andy Lund, dramatix. "How to Feed a Party of 5000," Susan Cowsar, dramatix. "Fish and Loaves," Michelle Pitman, dramatix. 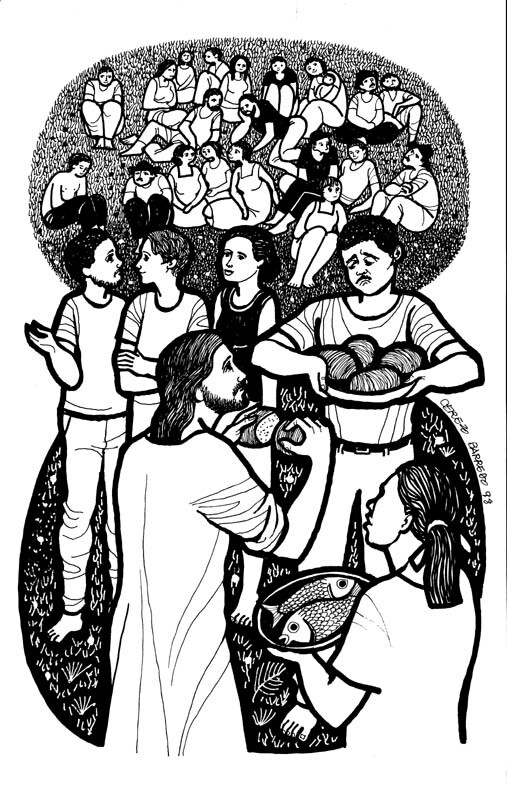 "Five Loaves of Bread and Two Fish," from A Certain Jesus by Jose Ignacio and Maria Lopez Vigil. Ideal for catechetical and liturgical dramatization of today's gospel. Claretian Publications. Clip Art Images: Matthew 14:13-21, Misioneros Del Sagrado Corazón en el Perú. Matthew 14:13-21, at Cerezo Barredo's weekly gospel illustration. Liberation emphasis. Clip Art: Jesus Feeds the 5,000, Julius Schnoor von Carolsfeld woodcuts, World Mission Collection, Wisconsin Evangelical Lutheran Synod. Making Lunch, After Eden Cartoons, Dan Lietha, Answers in Genesis. “In Cana at a Wedding Feast,” an original hymn by Carolyn Winfrey Gillette, 1999. This hymn celebrates Jesus' miracles (water into wine, feeding thousands, calming the storm and healing the blind) are celebrated as signs of God's love in the world then and now. Tune: ELLACOMBE 8.6.8.6 D (“I Sing the Mighty Power of God”). "Where Is Bread?" original hymn by Carolyn Winfrey Gillette, tune: ABBOT'S LEIGH 8.7.8.7.D "God Is Here!" Hymns with Scripture Allusions: Matthew 14:17, 19. The Cyber Hymnal. "Hunger in Their Souls," Brenton Prigge, NewHymn, weekly new, relevant hymn set to traditional tunes.